Burj Khalifa, known as Burj Dubai prior to its inauguration,a skyscraper in Dubai. it is the tallest human-made building in the world. The height of Burj Khalifa is around 829.8 meters. 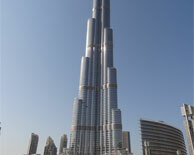 Burj Khalida's Construction stared on 21 September 2004, and had completed on 1 October 2009. The building officially opened for public on 4th January 2010, with the new two square kilometers development called Downtown Dubai along with Sheikh Zayed Road. The tower's architecture and engineering were done by Skidmore, Owings and Merrill of Chicago. The primary contractor was Samsung C&T of South Korea. Burj Khalifa was designed to be a large-scale and mixed-use development that includes 30,000 apartments, nine hotels that includes The Address Downtown Dubai, three hectares of parkland, 19 residential towers, the Dubai Mall, and 12 hectare human-made Burj Khalifa Lake.